Of course the browsers only understand the usual CSS Syntax so .LESS needs to translate the Stylesheet. For this we have several solutions. For .NET developer I recommend the dotless Project. The dotless Project is a porting of the original Ruby Project on .NET. In the Downloads there is also a “Compiler” integrated which you can call on the CMD. But there is a “Watcher” too so it’s not possible to start the Compile Process manual. More about this you can read on Wiki. With this method the transformation will start while it’s running – you don’t have to create a CSS File by yourself. There are different ways but it’s always the dotless Project. On this library we are able to start the transformation from the code. How this could look like you will see if you read this nice description (even if it’s a little bit old) Dynamic Dot Less CSS With Asp.net MVC 2. 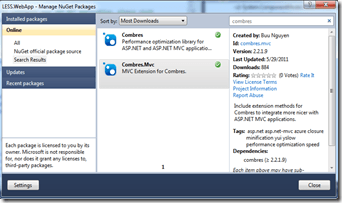 The usage of Combres after the installation is simple (and well described on the ReadMe Files). Combres is able to “manipulate” files before they will be delivered. Also integrated is a filter for DotLess (a view into the code you will find here). All you have to do is to put the DotLessCssFilter into the Combres.xml and the .LESS Css file as resource.